Some of these corrections are serious stuff. In my own case, I have vivid memories of leading walks in New Zealand with declination corrections between 24° and 26° set. I was using a compass which could be rotated in its baseplate and then locked. With such large corrections set, the compass looked as if it was broken! 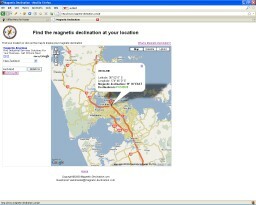 You can look up magnetic declination by quoting place names. There are some useful models where you can get the magnetic declination by keying-in the Latitude and Longitude of your place of interest. These are usually easy to find from a map and they do not need to be too accurate for simple navigation for walkers. In the NOAA website below, the data will be valid for the current date and will show declination, dip and their future variation rates. If you do not have a map handy, then you can use the Getty Thesaurus to get the latitude and longitude by place name. For UK declination values by from OS grid refs use the British Geological Society website.